The following information is from a posting written by Gene Miller, a staff member of the Takoma Park, Maryland Library. To open the Table click on the PDF icon. "The African-American community in southern Garrett County from about 1870 -1930 is not well-documented. It was small, numbering fewer than 200 at its largest, but still large enough to have built its own church building, the Bethel A.M.E. Church at the corner of N.5th and E. High Sts. Many worked at the railroad resorts/hotels for which southern Garrett County was renowned. When the great hotels began to fail, that work began to dry up. Pretty much the only other work available was the lumber industry or farming. From a peak population of 185 in 1890, the African-American community dwindled until the 1930 census showed that there were 24 African-Americans left. It was around this time, that the A.M.E. church building was sold. 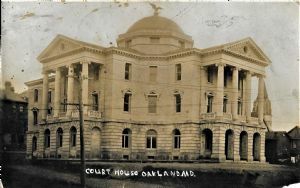 (It was moved south of Oakland where it is now used as a machine shop. The Garrett County Historical Society has placed a historic marker in front of it.) By 1940, the number was down to 5. One way of gauging the size of the community is through looking at the vital statistics for the era, so I extracted the names of grooms and brides from the register of marriage licenses issued at the Garrett County courthouse from 1872 - 1918. Because of Maryland required no-waiting period between the issuance of the license and the ceremony, many couples came over to Maryland from neighboring states to get hitched quick and get out. The residency indicators show that Oakland was quite popular as a marriage destination for neighboring West Virginians. It also shows that even as early as 1918, very few of the couples were local to Garrett County any more. The officiant is also shown. Among the names is William Walker, who was the pastor at the Bethel A.M.E. Church for a while."